During World War I the fighting that took place along the Western Front through France and Belgium was the most destructive and enduring of all of the theatres of war. 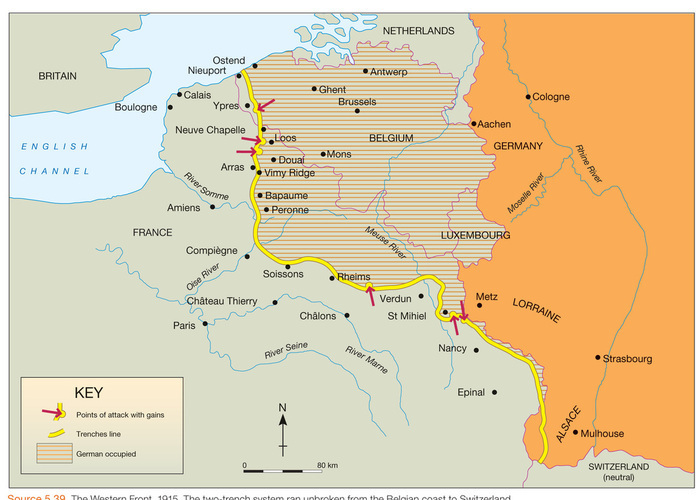 In August 1914, the Germans had marched through Belgium into France. Fierce resistance from the British and French stopped them from moving further into France. However, the Allies were unable to drive the Germans back. By Christmas 1914, there was a deadlock. The Germans and the Allies faced each other across a line of trenches that stretched from Ostend on the Belgian coast in a south-easterly direction to the Swiss border (more than 600km). The Western Front is seen by many historians as the defining experience of World War I. New weapons, such as gas and tanks, were introduced there. Defensive tactics using machine guns, trenches, barbed wire and artillery meant that rather than a rapid war of movement, war on the Western Front became bogged down in a senseless series of attacks and counter-attacks, each achieving little but costing millions of lives. After the evacuation of Gallipoli, the Australian Imperial Force (AIF) regrouped and retrained in Egypt before most were sent to the Western Front, which stretched from the North Sea on the Belgian coast to the French-German-Swiss border near the Swiss town of Basel. It was felt that the increase in troop numbers could help win against the German Forces. In August 1916 there were 49 British and 111 French divisions on the Western Front facing 120 German Divisions. The first ANZAC troops arrived at the French port of Marseilles on 19 March 1916. They were taken by trains to a quiet section of Flanders behind the British lines called 'The Nursery', where they received training on how to survive and fight in the trenches. The arrival of the First and Second Australian Divisions and the New Zealand Divisions brought the total British forces to over 1,260,000 Men. The British hoped the increased troop numbers provided by the ANZAC forces, together with almost 100,000 new recruits each month coming out of Britain would give them the winning edge agains the Germans. The German offensive at Verdun meant that British military planers were desperate to put pressure on the Germans at other points along the front line. 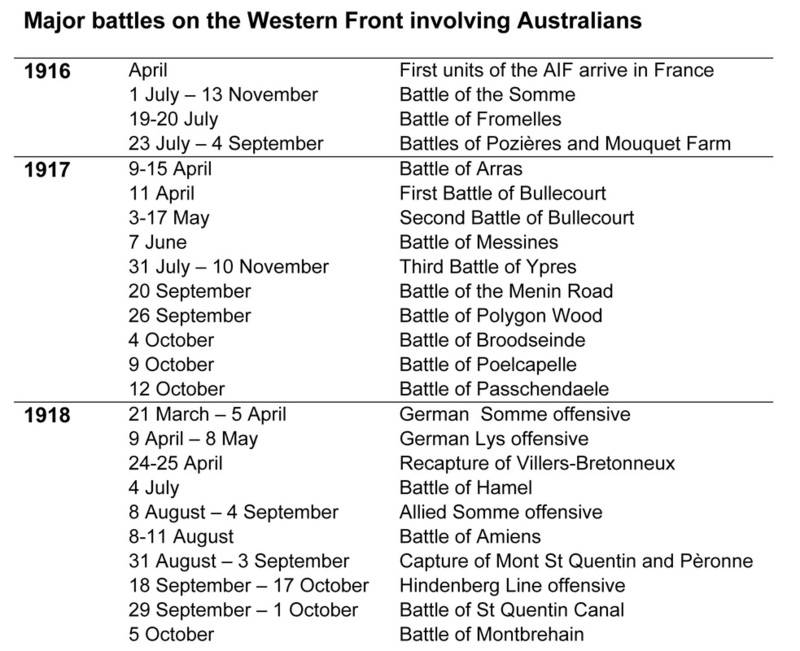 Australia suffered great losses along the Western Front. Of the 295,000 who served some 46,000 were killed in action or died of wounds. Tens of thousands more were injured. 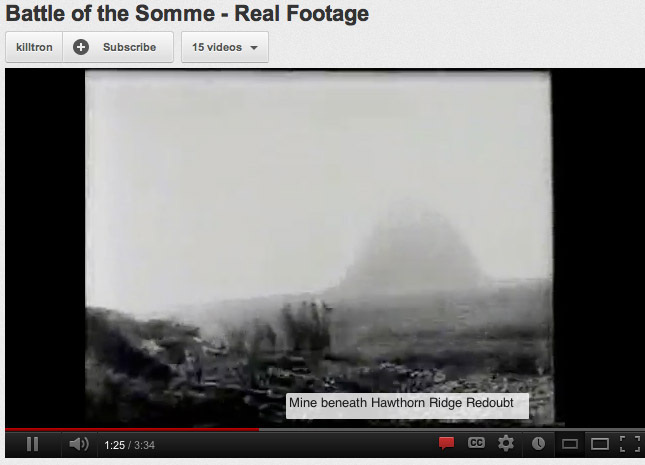 The first major battle involving Australians was on 19 July 1916 at Fromelles. The aim was to prevent the Germans from sending reinforcements to the Somme but the attack was a complete failure. Within twenty-four hours the Australians were forced to retreat to their own lines and the AIF’s 5th Division suffered more than 5000 casualties. 1917 saw more bitter fighting. A further 76,000 Australians became casualties in battles at Bullecourt, Messines and the four-month campaign of the 3rd battle of Ypres, commonly known as the Battle of Passchendaele. At year’s end the five Australian divisions were organised into the Australian Corps and spent the winter of 1917-1918 in Belgium. In March 1918, the Germans mounted a major attack and when a crisis developed on the Somme, Australian divisions were hurried south to help hold back the German advance. After a number of battles Villers-Bretonneux was cleared of enemy troops on 25 April, the third anniversary of the Anzac landings at Gallipoli. This action marked the effective end of the German drive towards Amiens. The Allies then prepared to go on the offensive, and the Australian forces, commanded by Lieutenant General John Monash, were involved in further actions including the Battle of Hamel on 4 July 1918. This battle was a great success and featured offensive techniques such as the co-operation of infantry, artillery, tanks and aircraft which were to be used a month later on a much larger scale. In August 1918 the Allied forces began 100 days of operations that would lead to the Armistice, beginning with an attack known as the Battle of Amiens. The Australian Corps played a leading role in the offensive until it was withdrawn, exhausted, after the Hindenburg Line had been broken. By then it had cemented its reputation as one of the foremost fighting formations. Its feats, and those of the AIF as a whole, were characterised by the historian Charles Bean as ‘a possession forever‘ for the Australian nation. Between 1915 and 1918, many attempts were made to break the stalemate of trench conflict. These attempts tended to follow a pattern. Initially there would be a long and sustained artillery attack—opposing trenches would be bombarded with explosive shells. These attacks could go on for a few hours or sometimes for many days. It was believed that this would force the defending troops underground, destroying their fortifications and clearing the way for troops to cross no man’s land (the narrow strip of land between opposing trenches that belonged to neither army). Weighed down with heavy equipment, soldiers would cross the strip of territory to their opponent’s trenches. Struggling through mud-filled shell holes created by their own artillery, they might learn that the bombardment had not destroyed the barbed-wire obstacles between the lines. More frightening still was the possibility that the artillery attack had failed to destroy the enemy’s position. Often, as attacking soldiers made their way across no man’s land, the enemy would emerge from deep bunkers to fire on them with machine guns. Generally, such assaults on enemy trenches failed to achieve their goals. Confusion, smoke, noise and death turned plans into chaos. If attackers reached enemy lines, hand-to-hand (or one-on-one) combat with rifles, bayonets, pistols and grenades often followed. If ground was gained, it could be retaken in a counter-offensive only weeks later. The only real consequence of most of the battles that took place on the Western Front over four years was death and injury. Later in the Somme campaign, Australian and New Zealand troops fought at Pozières from 23 July to 8 August 1916. After making early gains, Australia suffered over 23,000 casualties. By the end of the Somme campaign, casualty figures for the Allies were around 620,000 dead and wounded, and 500,000 for the Germans. In your own words, define the Western Front. Why had the war become ‘bogged down’ on the Western Front by the end of 1914? What was 'the nursery' and what was its purpose? What can you learn about the resources and tactics of the two sides from the fact that there was a stalemate along the Western Front for four years? Why is the first Battle of the Somme regarded as one of the most disastrous battles of the war? When it was obvious that little or nothing was gained through repeated assaults on enemy trenches, why do you think military commanders continued to order these assaults? Despite their knowledge of terrible loss of life and injury, soldiers continued to take part in these assaults on the Western Front. Suggest three reasons why they did so. Why were Western Front battles such a waste of time? At the start of the war, a small number of women wanted to join the services but were told that war was ‘no place for ladies’. The only women allowed to enlist and serve overseas were nurses. The nurses worked under appalling conditions, especially on the Western Front where makeshift field hospitals were set up often in trenches behind the lines. The nurses became known as ‘the roses of no man’s land’. Over the course of World War I, 2562 Australian nurses joined the AIF as members of the medical units. Out of this number, 2139 served overseas in the Middle East and on the Western Front. Twenty-five women lost their lives while serving overseas and 388 received military honours. "I cannot remember what came next, or what I did, except that I kept calling for the orderly to help me and thought he was funking [showing cowardice], but the poor boy had been blown to bits. Somebody got the tent up, and when I got to the delirious pneumonia patient, he was crouched on the ground at the back of the stretcher. He took no notice of me when I asked him to return to bed, so I leaned across the stretcher and put one arm around and tried to lift him in. I had my right arm under a leg, which I thought was his, but when I lifted I found to my horror that it was a loose leg with a boot and a puttee on it. It was one of the orderly’s legs which had been blown off and had landed on the patient’s bed. The next day they found the trunk about 20 yards away." What qualities did nurses need to possess in order to do their jobs successfully under such difficult circumstances? Why do you think that women were excluded from the armed services but were encouraged to join as nurses?